Endogenous ligand for APJ, an alternative coreceptor with CD4 for HIV-1 infection. Inhibits HIV-1 entry in cells coexpressing CD4 and APJ. Apelin-36 has a greater inhibitory activity on HIV infection than other synthetic apelin derivatives. The oral intake in the colostrum and the milk could have a role in the modulation of the immune responses in neonates. May also have a role in the central control of body fluid homeostasis by influencing AVP release and drinking behavior. 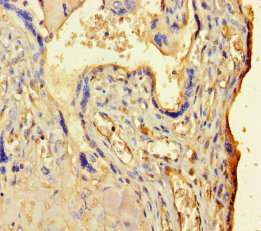 Apelin Polyclonal Antibody. Unconjugated. Raised in: Rabbit.